Potato salads are like snowflakes. No two recipes are ever alike. 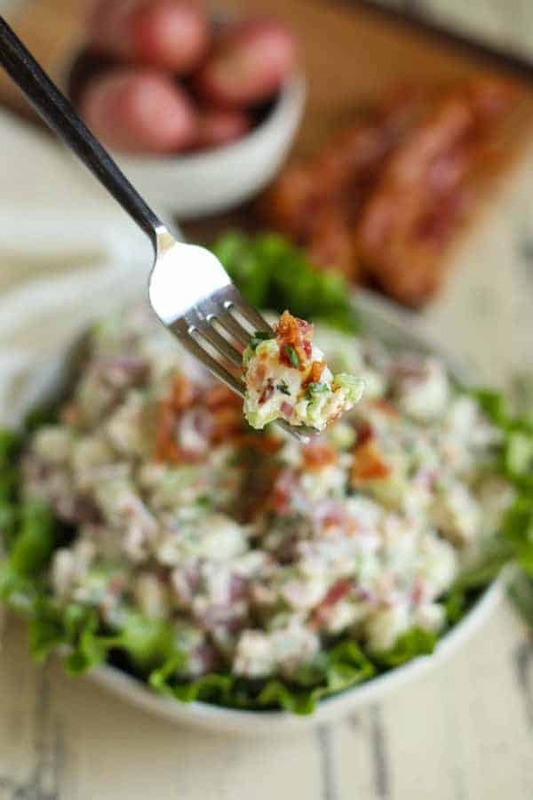 Ask ten friends or relatives how they make their potato salad and you’ll likely get ten different recipes or methods. Which is great, because variety is the spice of life, but it can also be a point of contention when it comes to potato salad. Some like theirs with mustard, some with pickles and some with hard-boiled eggs. 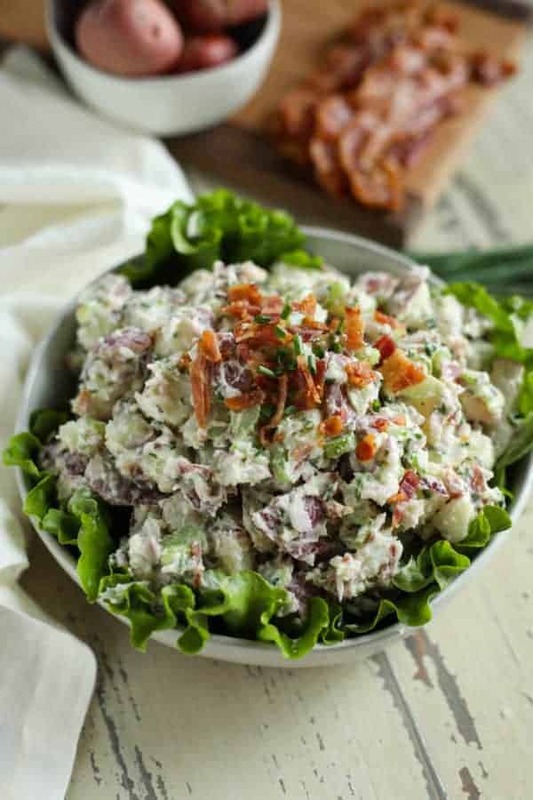 Ultimately, though, we can all agree that potato salad – especially this Bacon Chive Potato Salad – is a necessity at backyard barbecues and potlucks. I have to admit that I never ate potato salad growing up. I just couldn’t get on board with cold potatoes and mayo. In fact, it wasn’t until I was in my late 20s when I found a recipe in Cooking Light magazine for a sour cream-based potato salad that featured chives and blue cheese that I actually tried more than the tiniest of forkfuls and enjoyed it. That recipe then inspired me to create a similar potato salad recipe for my own wedding that I’ve shared here. And if you want something incredibly delicious, but totally unconventional, check out our Roasted Sweet Potato Cauliflower Salad or Warm Chipotle Lime Sweet Potato Salad. Fast forward a couple decades and I’m still a fan of that potato salad. 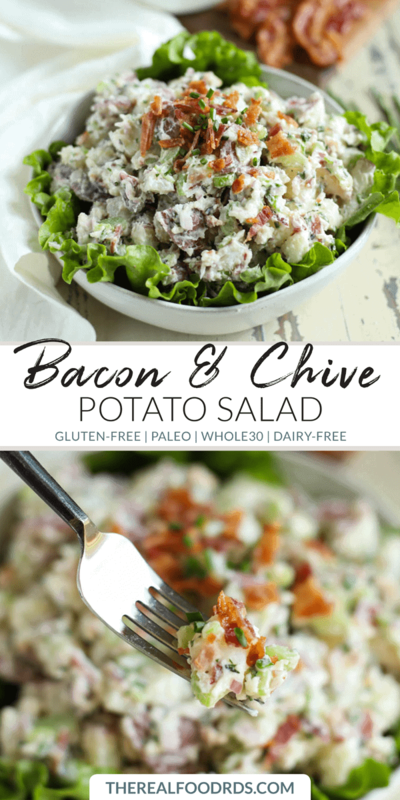 However, since sour cream is dairy and I wanted this recipe to be Whole30-friendly, I swapped out the sour cream for compliant mayo and replaced blue cheese crumbles with salty bits of crisp-cooked bacon. Thinly sliced celery gives it that crunch you expect of any good potato salad while the fresh parsley and chives add a bright punch of color and flavor to keep things interesting. Need I say more? 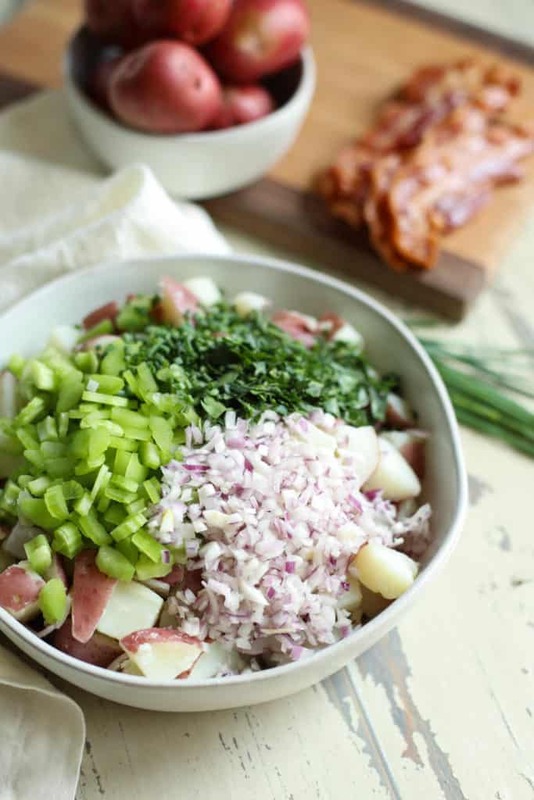 Sure, you could leave the bacon out of this recipe, but it’s that salty/savory quality that, when combined with the parsley and chives, makes this potato salad really pop. How to make bacon in the oven. 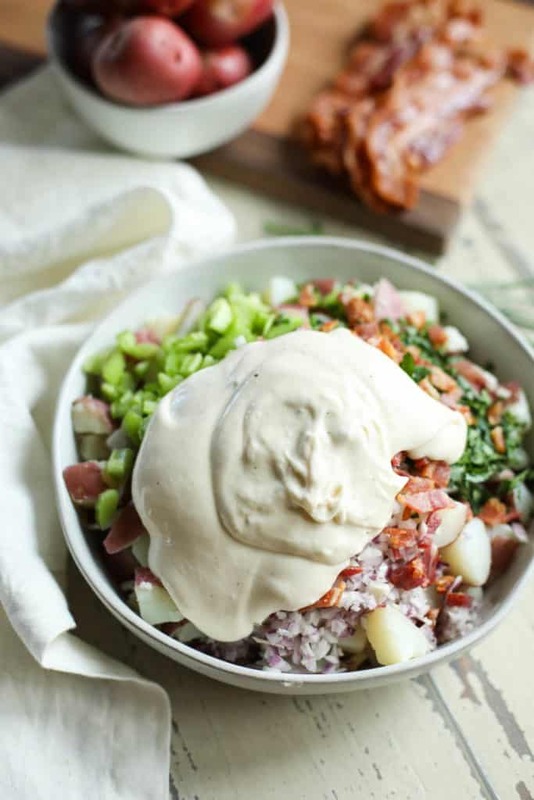 The oven is my preferred method of making bacon for this Bacon Chive Potato Salad and, well, just about every other application you can imagine. At first, this may seem strange if you’ve only ever fried your bacon in a skillet on the stove, but hear me out. Baking your bacon in the oven is so much faster and the clean up is minimal. No more wiping splattered grease off the stovetop or walls. And (this may be the most exciting part) your bacon stays flat making it easier to chop or add or a sandwich or wrap. Line a large, rimmed baking sheet with parchment paper. Allowing the paper to go slightly up the sides of the pan without hanging over will help make clean up even easier. Lay bacon in a single layer on the pan taking care not to crowd the strips. You may need to use more than one pan depending on how much bacon you’re making. Insert pan into the oven – don’t worry if it’s not fully preheated – and bake 10 minutes. After 10 minutes, open the oven door and rotate pan. Continue cooking an additional 5 minutes or until bacon is as crisp as you like it. Keep in mind that it will crisp up just a bit after you remove it from the oven too. 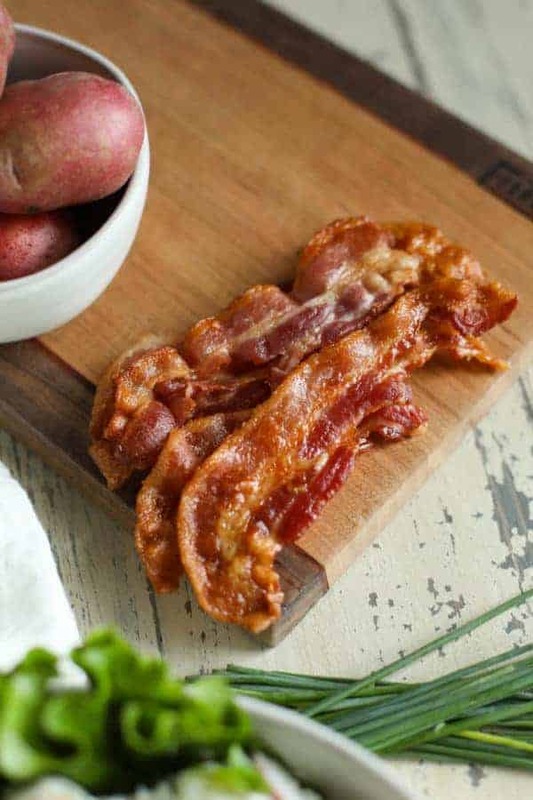 Once the bacon is cooked to your liking, remove the pan from the oven taking care not to spill any grease on yourself. 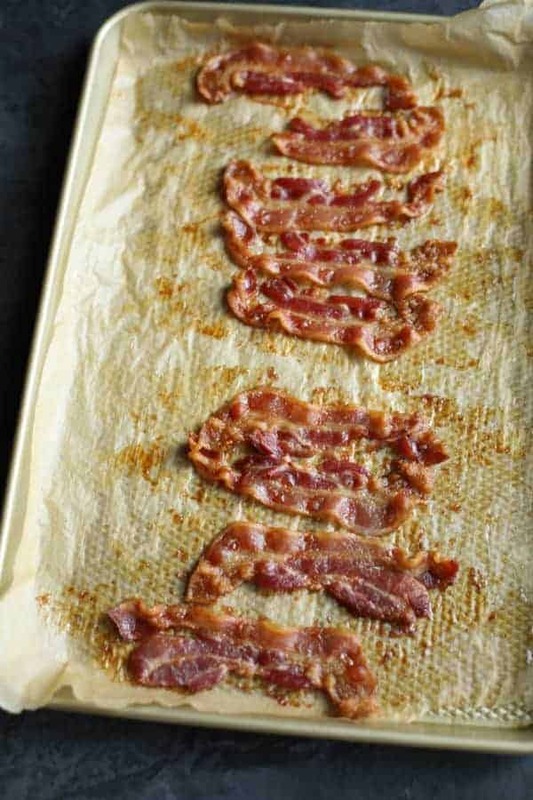 Transfer strips of bacon to a paper towel-lined plate. If you plan to save the bacon grease for another use, carefully tip the pan up and pour the hot grease into a glass jar. Allow pan to cool a bit before removing and discarding the parchment paper. If you play your cards right here – meaning you have enough parchment paper on each side of the pan to keep the grease on top of the paper – you may not have much clean up at all. 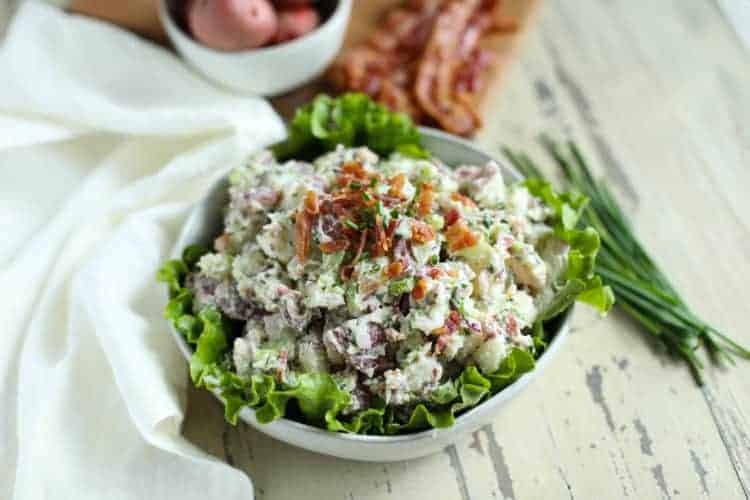 Whether it’s a potluck or party, you’re guaranteed to get compliments on this Bacon Chive Potato Salad because it’s something new and fresh. It’s also perfect for meal preps because it holds up well in the fridge for 3-4 days (and some may argue that it actually gets BETTER as the flavors have time to mingle). If you’re prepping ahead, you may want to leave out the bacon until just before it’s time to serve so it’s nice and crisp. But definitely you don’t have to if you’d rather it be ready to eat when you are. 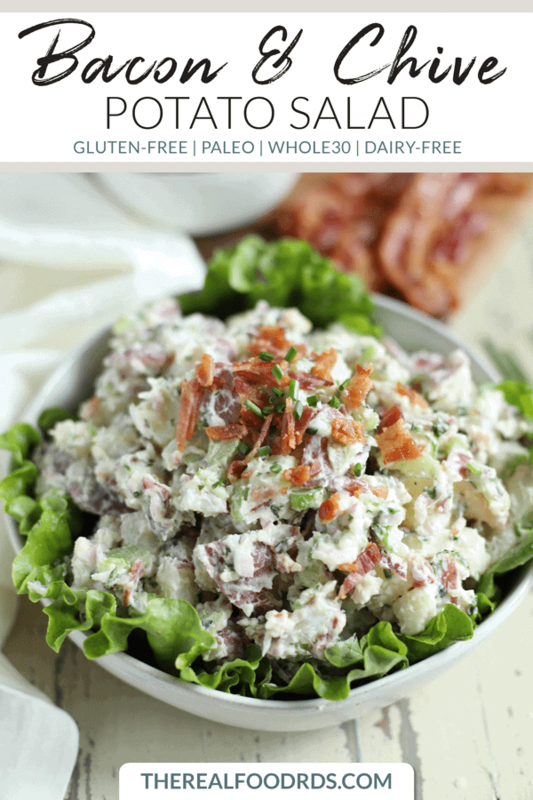 Are you ready to switch it up a bit and give this Bacon Chive Potato Salad a try? Remember, variety is the spice of life and the weekly meal plan or potluck spread. Add potatoes to a large saucepan. Cover with 2 inches of water, cover with a lid and bring to a boil (remove the lid once water begins to boil). Cook potatoes until tender, about 20-25 minutes. Remove potatoes from heat and drain. Place potatoes in the fridge to cool (this step may be done up to 2 days in advance). 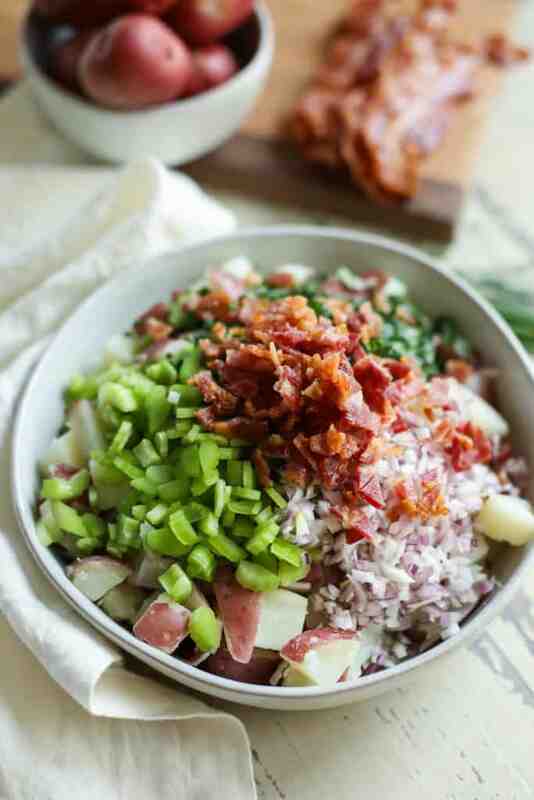 To chilled potatoes, add celery, red onion, chives, parsley and cooked bacon. In a small bowl, whisk together mayonnaise, garlic powder, apple cider vinegar, salt, and pepper until well combined. Pour dressing over potato mixture and stir well to combine. Taste and adjust seasonings as needed. Serve immediately or store in a covered container in the fridge for up to 3 days. ** For an egg-free version (not Whole30-friendly): Replace the mayonnaise with organic sour cream. What’s your secret to killer potato salad? Mustard? Pickles? Share in the comments below, we’d love to hear from you!